(Nanowerk News) It turns out that there is a striking similarity between how the human brain determines what is going on in the outside world and the job of scientists. Good science involves formulating a hypothesis and testing whether this hypothesis is compatible with the scientist’s observations. Researchers in the Max Planck Institute for Brain Research in Frankfurt together with the University of Glasgow have shown that this is what the brain does as well. 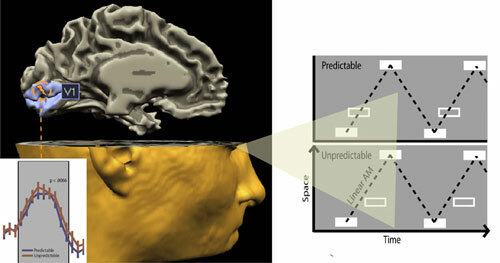 A study shows that it takes less effort for the brain to register predictable as compared to unpredictable images ("Stimulus Predictability Reduces Responses in Primary Visual Cortex"). Alink and colleagues based this conclusion on the characteristics of responses in the primary visual cortex. It is known that the primary visual cortex is critical for vision and that responses in this brain area create a map of what we are currently looking at. Alink and colleagues, however, for the first time show that images induce smaller responses in this area when they are predictable. The implication of this finding is that the brain does not just sit and wait for visual signals to arrive. Instead, it actively tries to predict these signals and when it is right it is rewarded by being able to respond more efficiently. If it is wrong, massive responses are required to find out why it is wrong and to come up with better predictions. One implication of this study is that when you enter the office the image of your colleague at his desk, who has the annoying trait of always being there before you, will require very little effort for your brain to register. The image of your mother in law sitting on the same chair, however, would make your brain go haywire. Not necessarily because you are not fond of this person but because this image makes it clear to your brain that it is doing a lousy job at predicting what is going to happen next and that it will have to make an effort to improve its predictions. This suggests that the brain’s main job, alike that of a scientist, is to generate hypotheses about what is going on in the outside world. The study represents a significant advance in understanding how the brain supports visual perception. An important implication of this study is that visual perception depends on an active generation of predictions. This stands in contrast to the classical view that visual perception mainly results from a more passive cascade of responses to visual signals spreading through the brain. Further research is still required to determine whether indeed we are all carrying along a little scientist in our head. At present the idea of the scientific brain is rapidly spreading through the neuroscience community and provides a novel approach to resolving how the most complex organ of the human body works.